Two shots of an attractive Eichler, home to the Welsh family, along Atherton's Hawthorne Avenue. Above: Note the life-sized chessboard in the backyard lawn. 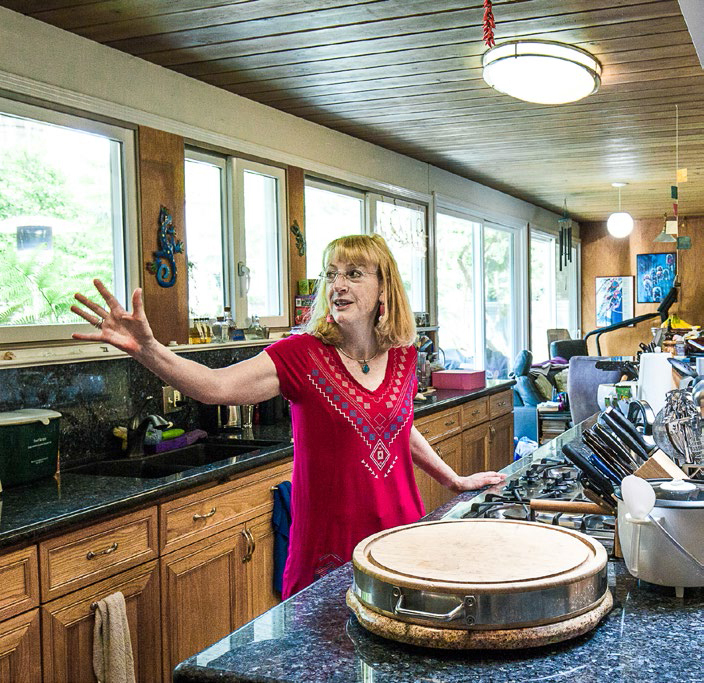 Preservation-minded Debbie Pinkston in her Atherton kitchen. Joe Eichler began building in these two communities with high hopes. 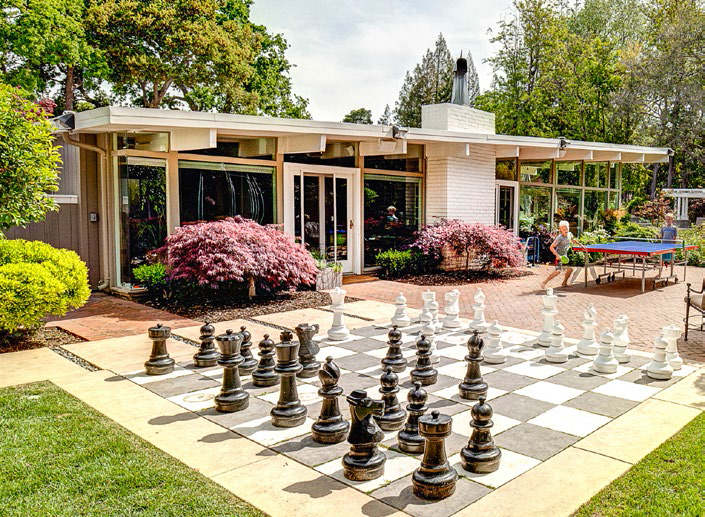 His history in Atherton and Hillsborough runs counter to the oft-told tale that Eichler aimed his homes at entry-level buyers. It shows that, from the early days, he targeted as well the middle class—and affluent. The first affluent client he found for either of these towns was—himself. And it's notable that of the three houses Joe built for himself and family during his 25-year career, one was in Atherton, one in Hillsborough, and one in San Francisco (the penthouse of the Summit tower). That's because what Joe really wanted at that time was to emulate the home designed by Frank Lloyd Wright in which he'd lived during World War II—the Bazett house of Hillsborough. There, Eichler had developed his affection for modern architecture. Anshen and Allen, the architects who were simultaneously designing Joe's first architect-designed tract in Sunnyvale, created his Atherton home in homage to the Bazett, with a similar plan and Wrightian details—including built-in furnishings and a play of angles. Paul Feder, who bought the 3,700-square-foot, four-and-a-half-bath home in 1966, and his wife Ginny Anderson have preserved it in almost all its details, save for a revamped kitchen. They perform in their living room with a recorder ensemble regularly. "The house is an etude in parallelograms," Feder says. "Our shower is triangular. There's not a square room in the house. The house has got repeating patterns over and over again, the way an artist uses different colors and repeats the colors. The house is a work of art." The Joe Eichler home is in the leafy neighborhood of Lindenwood, where in the early 1950s Joe planned an upscale tract. A 1953 Eichler Homes brochure boasted of three- and four-bedroom designs from Anshen and Allen, selling for $42,500-$49,500, high for the time. Only a few were built. They probably included two homes on Hawthorne Avenue, of which one remains, and the one across from the Joe Eichler home that was lost in 2015.